When done properly, lifting weights is generally a safe and effective strengthening workout for several areas of the body. However, lifting weights excessively or improperly can easily result in jury. Since the shoulder joint is responsible for much of the movement involved in weightlifting, it is also one of the most common locations for weightlifting injuries. 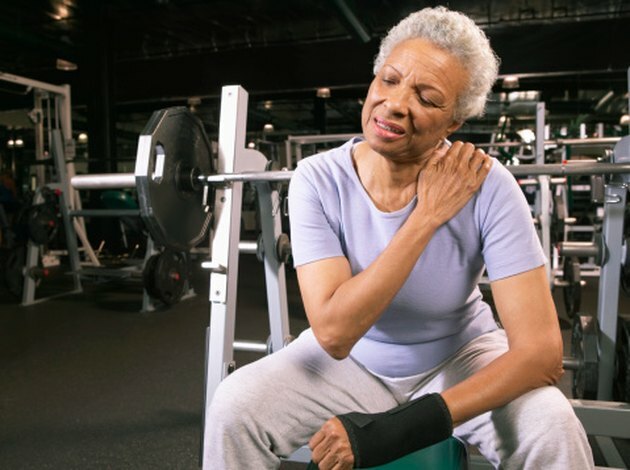 If you experience pain radiating from your shoulder to your elbow after lifting weights, there are a variety of potential causes to consider. A complex group of four muscles, the rotator cuff extends from the collarbone to the upper arm bone. The main functions of the rotator cuff involve supporting, cuffing and rotating the shoulder joint. The repetitive movements required for weight lifting occasionally cause the rotator cuff to rub against the outer edge of the shoulder blade. When this happens, the rotator cuff becomes inflamed and irritated. As the rotator cuff swells and expands, it may become trapped underneath the shoulder blade, causing further irritation. This condition, known as rotator cuff impingement, results in intense shoulder pain that often radiates from the shoulder to the elbow. If not treated properly, it may eventually cause the tendons to tear or separate from the bones. Tendinitis is a fairly familiar problem that can affect nearly any tendon in the body. Quite simply, tendinitis refers to an inflammation of the tendon. The biceps tendon is the one most commonly affected as a result of excessive or improper weightlifting. Similar to rotator cuff impingement, biceps tendinitis is generally a result of the tendon rubbing against bone. In fact, biceps tendinitis and shoulder impingement often occur together. Symptoms include a slow onset of pain that begins on the front or side of the shoulder and travels down the arm toward the elbow. Oftentimes, the pain becomes worse when the arm is lifted away from the body or over the head. Within the rotator cuff, the supraspinatus muscle is the major muscle that spans across the top of the shoulder blade. This muscle alone is responsible for lifting the arms to the side. It is also responsible for holding the arm bone inside the shoulder joint as you throw an object. A thick tendon attaches the supraspinatus muscle to the upper arm bone and a small slippery sac of fluid sits over the top of this tendon. This sac, known as the subacromial bursa, helps lubricate the tendon as it moves inside the joint. Similar to biceps tendinitis, this bursa occasionally becomes pinched between bone, leading to inflammation. Although pain is most intense near the top of the shoulder, it may radiate down the arm. A shoulder dislocation is a serious injury that involves the upper arm bone popping out of the shoulder socket. Forceful blows to the shoulder or extreme rotation of the shoulder joint are the most common causes of a shoulder dislocation. In most cases, lifting weights should not easily cause a shoulder dislocation. However, rotating the shoulder joint excessively with heavy weights in your hands could lead to the injury. Symptoms involve a visible deformity near the shoulder, along with swelling and bruising. Intense pain is often felt across the entire arm, occasionally accompanied by numbness, weakness and loss of movement. Immediate medical attention is necessary to avoid permanent damage.